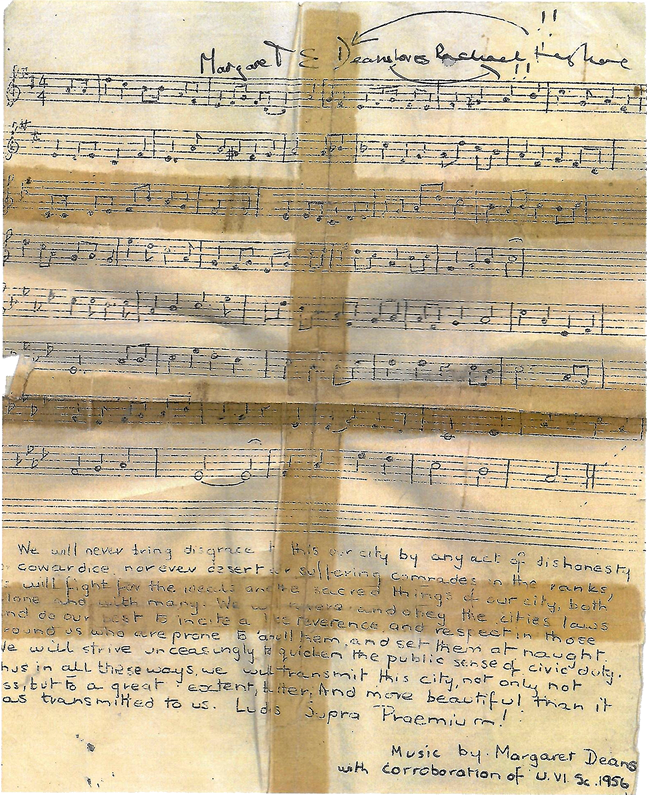 These are Margaret's recollections associated with the copy of the School Song she was given as a first year in 1956. Note the 'autographs' on the top – and excuse the Sellotape marks…. The original is over 61 years old! 'The school had been using a song from one of the boys' public schools as its school song. This was not considered appropriate. Margaret Deans (1950 – 1957) wrote the 'new' one in 1956. Strangely, she set lines from an oath sworn by young men in Classical Athens on entering the Ephebic Military College – they were required to graduate to become citizens. And it ends with the Latin school motto! Rachael was very popular with the juniors. She was great fun. There are many stories of her antics, eg trailing a piece of string with a loop and calling to an imaginary dog! She was also very well liked because she was not only already celebrated for cricket and hockey within the school (She was goal keeper, a role which she treated like that of a soccer keeper, running forward, pads and all, to clear balls - very intimidating and successful – wonderful to watch) but also she spared a lot of time to run cricket training for the juniors, including people like me who were hopeless. So the girls were all trying our best to learn the song for her. I think at the time UVIS were feeling extremely excited and pleased with their teamwork on that day. They had just managed to get that very tricky song over to the huge hall full of all the girls, and I was at the front as a first-year pupil, and presume that was how I got the autographs on my copy of the song - in the euphoria following the success of the exercise!